The realization that ginger is a lot easier to find these days than ginger beer, coupled with my recent completion of the beer component of my wine certification, got me thinking about the possibility of brewing ginger beer at home. Thinking about brewing got me thinking about alcohol content – as it’s been drilled into me that fermentation starts with yeast and sugar and ends with CO2 and alcohol. And yeast. And other stuff. But basically if you’re brewing something fizzy, you’re going to get alcohol too. This is apparently true not only of ginger beer but of bread as well (though the alcohol in bread, such as it is, does not largely survive the baking process). Commercial non-alcoholic ginger beer avoids the issue by skipping the brewing process in favour of carbonation by way of pressurized CO2, in the manner of any soft drink. While I was pondering the logistics of it all, and re-calibrating ratios for high-octane mules, dark-and-stormies and bucks, I was alerted to the heretofore unheralded presence of Crabbie’s Alcoholic Ginger Beer in the LCBO ($3.65 the pint and a decidedly conversational 4% ABV). And though at some point this year, once the basement is refinished and an additional refrigeration unit installed, I may start experimenting with home brewing, to hell with that now, I say, and hie to yonder booze store. 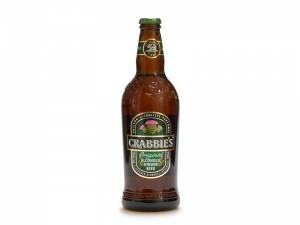 The Crabbie’s has a pale amber colour, retains a bit of a head, and throws off a pleasantly flowery (but not overly hot) ginger aroma. It smells more like ginger ale than the Grace’s ginger beer I’m used to. This is borne out on the palate where it’s very mild-mannered, sweeter and less spicy than my go-to non-alcoholic ginger beer but neither syrupy nor soft-drink sweet. Carbonation is on the low side of medium, mouth feel is a bit creamy, akin to a light ale, and the finish is medium short with a bit of ginger heat. The alcohol barely registers. Overall it’s pleasant and refreshing, but its sweetness makes me think it will do better as a mixer than as a session beverage. My first thought is a shandy, and sure enough it makes a fine bottom half to a pint of Guinness. It was my wife who introduced me to the tradition (and it may be exclusive to her circle of acquaintance) of drinking Black Velvets while watching the Oscars. That’s really the least you’ll have to do to get me to watch the Oscars, as they fill me with boredom and rage. The Black Velvet, on the other hand, fills me with Guinness and prosecco, which we use as a substitute for the traditional Champagne component. Cava also works a treat, as would some manner of Crémant. Of course I later found myself at another pub ordering a snakebite and receiving a lager and cider, because that is, in fact, what a snakebite is. When I asked the bartender what he calls a Guinness and cider then, he told me that would be a Crown Float. Rounding out the dance card is the Half and Half, which is Guinness and pale ale, which may also be referred to as a Black and Tan, though I would be reluctant to order one by that name unless I saw it listed as such in the menu.